The 7 layer salad recipe (shown above) and other dishes described here are standard variations of some of America's most popular recipes. Visit any link below for basic side dish recipes and serving suggestions. To view more recipes, visit the Home School page. 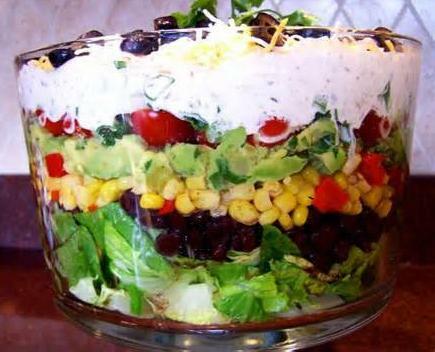 7 LAYER SALAD RECIPE - This versatile appetizer recipe is crispy cool visual delight. AMBROSIA SALAD - This sweet, fruity recipe is a popular American favorite during summer months. BEAN SALADS Protein-rich lunch or side dish recipes, best when served warm. CHICKEN SALAD No two chicken salad recipes are the same. This one features fresh grapes and chopped celery. COLD PASTA SALAD A hearty side dish recipe that functions as a meal. EGG SALAD Great when made into cracker sandwiches, or served as a raw veggie dip. GREEN SALAD Green salads are a fresh, lively start to any meal. JELLO SALAD This versatile recipe is served as an appetizer, side dish or dessert. RAMEN NOODLE SALAD A quick and easy lunch recipe. Elegant, inexpensive and delicious. BANANA BREAD 1 A very basic recipe that's always a treat. BANANA BREAD 2 This soft, creamy variety is wonderful served warm with butter. CIABATTA BREAD A soft, spongy Italian bread with a thin crunchy crust. BEEF BARLEY SOUP This recipe is a great appetizer, but hardy enough to be served as a meal. LOBSTER BISQUE A classy, creamy seafood dish, elegant when paired with the 7 Layer Salad recipe shown above. A warm cheese dipping sauce for breads, fruits and vegetables. DEVILED EGGS An easy way to jazz up ordinary hard boiled eggs. EGG ROLLS The classic Chinese recipe we all know and love. GRILLED CORN A perfect recipe for an outdoor summer barbecue party. GRILLED VEGETABLES Served as a healthy side dish or a complete vegetarian meal. HUMMUS A Middle Eastern dip served with pita bread or raw veggie slices. Cole Slaw - A popular American favorite. SCALLOPED POTATOES Cheesy and delicious with a baked brown topping. SWEET POTATO FRIES Crunchy salted french fries with an unexpected sweetness. TWICE BAKED POTATOES A smooth, creamy recipe with chives and two cheeses. Go here for a detailed list of Factory Outlet Malls in every state.